The new mini-expansion is part of the $35 Annual Pass for Destiny 2. Destiny 2 owners have some brand new content to sink their teeth into thanks to the upcoming release of a mini-expansion called Black Armory. Revealed today in a new video by Bungie, the Black Armory mini-expansion includes an interesting quest activity as well as brand new Exotic weapons to collect. 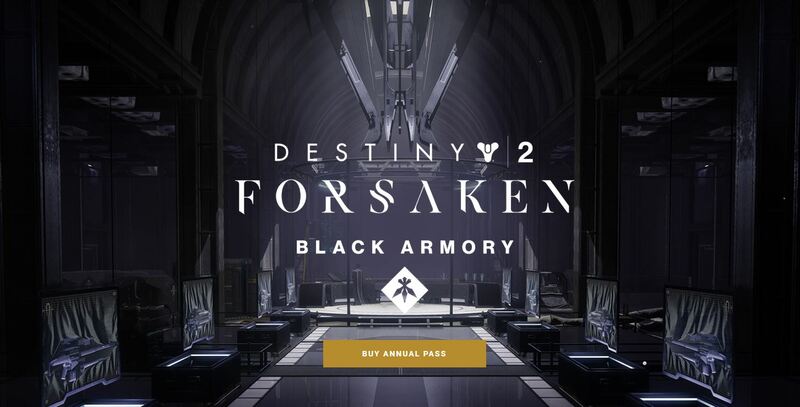 Black Armory is available to all players who previously purchased the $35 Annual Pass (which is still available for purchase if you're interested). Alongside Black Armory, Annual Pass holders get will two additional mini-expansions called Joker’s Wild and Penumbra next year. Basically, if new Destiny 2 content is your thing, the Annual Pass is definitely something to keep in mind. Unlike some of Destiny 2’s timed releases, Black Armory is scheduled to launch at the same time on December 4 across all Destiny 2 platforms including PC, Xbox One, and PlayStation 4. While smaller than the Forsaken expansion – which released a few months prior on September 4 – Black Armory includes the new Lost Forges quest line as offered by Ada-1. The Black Armory mini-expansion will be included as part of Destiny 2's new Annual Pass. "The Black Armory is not a campaign, it's a place. It's a source of new rewards, new forms of power, new mods for weapons, and new armor. It's a place where you'll meet Ada-1, who's a new story agent. She's an Exo and a relic from a lost Golden Age where there was a culture of Blacksmiths founded by three separate families." From what we can gather, after speaking with Ada-1, players will need to venture out into the world of Destiny 2 and reignite four different weapon forges. Combat will primarily be 'horde" style, where repairing these weapon forges trigger different enemy waves. As expected, players will need to form groups of three in order to handle these enemy waves all while placing materials in each forge. For more on Black Armory, be sure to check out the mini-expansion’s page on the Destiny 2 website, and watch the new video from Bungie down below!